Netflix (s NFLX) and Spotify are a bit like two peas in a pod: Both are championing all-you-can-eat subscription packages over transactional models for online media. Both are trying to establish themselves as global leaders. Both have the potential to disrupt traditional business models. Both want to be on as many devices as possible. Maybe they should just join forces, with Netflix buying the smaller Spotify? A quick but important preface: This story isn’t based on any rumors, and it’s definitely not meant to start one. To be honest, I don’t think Netflix is in the market of buying up companies like Spotify, especially after last year’s Quickster debacle. Netflix’s stock currently trades at $66.73, down from a high of $304.79 last summer. Endeavoring on an online music adventure would be suicide at this point. Instead, this story is purely meant as an academic exercise, albeit prompted by real-world conversations. A few weeks ago, I met with Michael Aragon, Vice President & General Manager, Global Digital Video and Music Services at Sony, (s SNE) who showed me some of the things his company has been doing in the music subscription space. One of the things that particularly caught my interest was that Sony is going to put a bigger emphasis on the possible synergy effects between its music service, its transactional VOD offering and its gaming business. Media recommendations. Subscription businesses like Netflix and Spotify generate tons of data. Combine them, and you’re likely to get even better recommendations. Some of these use cases are pretty straightforward: Viewers of Glee may want to be reminded of all the original songs that were covered in the latest episode they watched. Other linkages may be much more subtle – but if Netflix has shown anything, then it’s that it is very good at making sense of lots and lots of data. Device footprint. Spotify’s biggest asset in its quest to convert free users to paying customers are its mobile and connected device apps. However, the company hasn’t exactly been quick to expand in this realm. We waited forever for its iPad app, and the number of connected devices with Spotify on board can still be counted on one hand. Netflix on the other hand is now available on over 800 different devices, including virtually any connected TV and Blu-ray player. 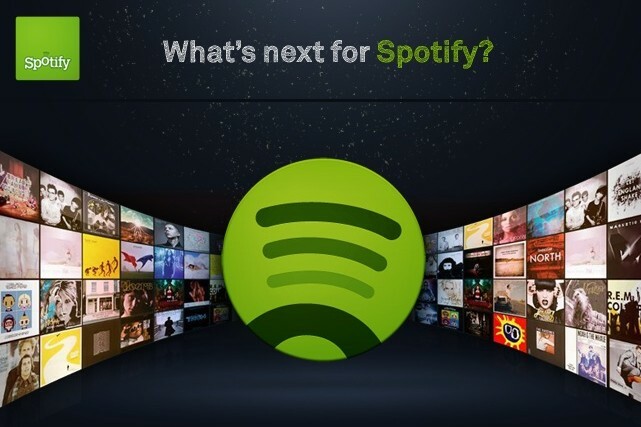 Tapping into that expertise could help Spotify to get a lot more paying users. International expansion. Netflix has halted its international expansion until its return to global profitability, and its foray into South America has been below expectations. Spotify on the other hand has been adding new markets at breathless pace. Seems like Netflix could actually learn something from the smaller company here – and of course use some of its office space around the world as it resumes its own expansion plans. Business models. Netflix is on the road to recovery, but there is no profitability in sight for Spotify. Some even claim that the company will never be profitable – at least not as long as record companies, who are also shareholders, dictate huge licensing fees. If Netflix has shown anything, it’s that it can get deals with media companies done, and Spotify could use some of that expertise to figure out deals that work for both sides. Network infrastructure. Netflix recently unveiled its own CDN, and it only makes only to use that kind of infrastructure for other services as well. Spotify on the other hand has been using P2P to offload some of its network costs, which could be an interesting model for Netflix, if only as a threat in its talks with operators that complain about too much traffic coming from Netflix’s network. As I said, this is really just a thought experiment, but I think it’s an interesting one. Media subscription businesses have a lot of similarities. In theory, it makes a lot of sense for companies like Netflix and Spotify to join forces. Of course, both businesses also come with huge risks – and combining risks those might be more than either can stomach. Or Spotify launches a video subscription service with similar content leveraging the existing accounts they have for music….$15 for all the music and all the video you want. Netflix really needs to consider supporting Linux/Open Source. Before you start laughing, read up on “Ubuntu”. Also “Linux Mint”, 5-6% of pc’s manufactured this yr will have Linux pre-installed. Not to mention Android (linux at its core). Its not a fringe market anymore. Ditch silverlight!! Reed Hastings is on Microsoft’s board. I don’t think he’ll be ditching Silverlight anytime soon. It doesn’t seem possible. NFLX is currently valued @ 3.7B dollars, yet I recall spotify’s last round was several (3-4B)…Netflix doesn’t have the money. They could do a stock transition. They cannot do any kind of transaction that doesn’t involve Spotify shareholders owning more of the company than Netflix shareholders. And since Netflix is public and >their< shareholders would sue, that's equally impossible. This idea is beyond fantasy as you are talking a company that is poor — Netflix — buying one that is richly valued and yet not yet rich — Spotify. Try a scenario involving someone rich (Microsoft, Apple, Google, Amazon) buying both and you might be onto something. I was thinking the same thing, but Netflix would probably doesn’t like Spotify’s contracts. Spotify has to pay a small royalty every time a song is played. Netflix pays up front, and one could watch the video one or one million times, with Netflix paying the same amount. Spotify isn’t big enough to change their contract.